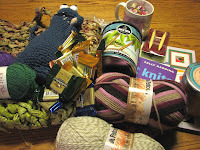 I finished up my package for the Hot Cocoa swap last week and sent it off in the mail. It was very fun gathering all the bits and pieces to include. Of course, the package had to include hot cocoa. I got some yummy cocoa at Whole Foods Market. And I included some gourmet marshmallows to make her cocoa extra special. My partner is allergic to wool so I sent Mission Falls 1824 cotton in a range of bright, spring-y colors. She said on a questionnaire that she'd always wanted one of Elizabeth Zimmermann's books, so that went in as well. And a package of the hot cocoa stitch markers I developed for the swap. 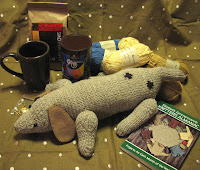 The big part of the package (especially in terms of time) was a knitted stuffie to help her beat the winter blues. My partner has a daschund, so when I saw this pattern, I knew I had to knit it for her. As my first knitted stuffie, it was maybe a bit overly ambitious. It took longer than I expected, but that was partly due to the fact that it's a pretty big dog (probably the size of a large daschund puppy) knitted on size 1 needles (what I needed to use to fit the gauge). But I was pleased with how it came out. I left it up to her to name the puppy... although someone suggested "Cocoa." Good idea! My swap package from my partner came a day after I sent mine out. What an incredibly thoughtful and generous package! Thanks so much, Brenda. The cookie monster is super cute!! Isn't he a cutie? I love the cookie crumbs (do the same thing myself...). om. . . is that a cookie monster? i want a bigger picture! he's adorable!